MoonWater is Rudy Adrian’s first release on the Lotuspike label. On MoonWater, Rudy dives deep into subtlety and meditative minimalism, using a single synthesizer–a Yamaha SY77. MoonWater is a beautifully crafted study in deeply serene and contemplative soundscapes. I have to confess, that when I first listened to this, I thought it was ok, but it didn't really grab me, the way Across The Silver River (his excellent collaboration with Ron Boots) did. However repeated listening has revealed this to be a beautifully understated gem. The title track gets us underway, and what a great start. Waves lapping on an empty beach, night sounds, and then layers of beautifully crafted synth work come together to make an extremely evocative piece that I could have listened to all night (if I didn't have 8 other tracks to review that is!). Midnight Fantasy Angel Part 1 is next. A heavily processed piano leads the way, gentle synth sounds working around a main theme, with occasional deep bass drones, and this is just great. I thought it very reminiscent of Vangelis, and there can hardly be higher praise. The extremely laid back and beautiful ambient sounds of Summer Fields are next and these could have been created by Steve Roach and it's all too easy to imagine fields of long grass being blown around by a hot summer breeze. The next three tracks, starting off with Midnight Fantasy Angel Part 2, (which is the CD's longest track), are I suspect the same piece, divided into three, for they all sound startlingly similar. The processed piano makes an appearance on all of them, and once again I'm reminded of Vangelis. However if I am to be honest, I would say that at over 12 minutes it is perhaps a shade too long, with, unfortunately, little to distinguish it from Part 1. As I say the next two tracks, Ancestral Legacy and The Legend of Kristy Lynn flow down a very similar path. Under Orion is the last track created specifically for this CD. This is another exceptionally beautiful track of first class ambient music. It is the one to listen to with the headphones on, as there is quite a lot going on in the background. The last two tracks are two of three live pieces recorded back in 2003, with the Zen sounding title of Three Views of a Japanese Garden Parts 2 and 3. Initially, they sound like Midnight Fantasy Angel again, but the first has some occasional wordless vocals on it, that I strongly suspect are sound effects, and the effect is quite startling. They are beautiful ambient tracks to complete the CD and they compliment the studio material perfectly. This is an excellent CD, and whilst it doesn't quite scale the heights of his collaboration with Ron Boots, it has much to recommend it. Those of you who like his more uptempo music, as Rudy himself puts it in the sleeve notes, might not enjoy this as much, but it is another interesting release from a musician who has quite a varied back catalogue, and if you are already a fan, you will undoubtedly like this. 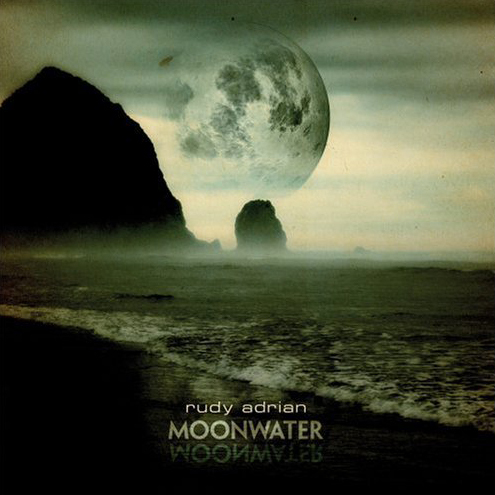 For pure, completely immersive ambient flow, it doesn’t get much better than Rudy Adrian’s unspeakably beautiful CD, Moonwater. Soft, consistently warm and fluid, Moonwater drifts through landscapes draped in calming twilight and built in quiet melodies. At low volumes, it’s soothing; in headphones, it’s astounding. Adrian constructs gossamer layers of sound and balances them steadily one atop the next, each arriving slowly and precisely, each new step a perfect complement to what’s come before. What makes it more interesting is that Adrian has crafted this superb work using just one old synthesizer, a Yamaha SY77, as its foundation. Particularly effective are the two closing tracks, ‘Three Views of a Japanese Garden’ parts 2 and 3. Part 2 features wordless chanting augmenting a meditative melody while stray but well-placed piano notes fall like raindrops onto lotus leaves. Part 3 floats with Zen-like grace, its component chords fading slowly until all that is left is a rising string melody, drifting quietly away toward dawn. Moonwater’ is Rudy’s first release on the rather ambitious Lotuspike-label. As explained in the booklet, the start of the music was more or less accidental as some of his main studio equipment broke down. Nevertheless, the outcome is a beautiful collection of relaxed and moody ambient music carrying some distinct elements of Harold Budd and Brian Eno. The title-track kicks-off with soft roaming music, continued on the flowing textures of the two-part ‘MidnightFantasyAngel’. ‘Ancestral Legacy’ features some nice flute over intimate textures before we move into the drifting, uplifting atmospheres of ‘The Legend of Kirsty Lynn’. This track creates a fantastic mood with its twinkling, heavenly soundtextures. The cd concludes with part two and three of an intimate live performance, of which the first one features some of Rudy’s occasional singing. In all, ‘Moonwater’ is peaceful, well composed ambient excursion deserving a high recommendation. As a bonus, the cd contains an almost five minute movie with great some great nature footage and music from the follow-up album, work-title ‘The Shadow Garden’. Rudy Adrian is equally at home doing all-out sequencer blitzes or doing mellow ambient and new age music. MoonWater falls squarely in the latter category, a blissful reverie of soothing sonics. Crickets and gently lapping water start the title track, followed by warm synth pads. ‘MidnightFantasyAngel, part 1’ approaches similar new age territory to The Healing Lake, predominantly a piano piece with a couple bright shimmering electronic touches deftly mixed in. ‘Summer Fields’ is perhaps softest of all, just a couple of quietly floating synths that seem to melt into the background; absolutely lovely. ‘Ancestral Legacy’ features beautiful wood flute. ‘The Legend of Kristy Lynn’ is shrouded in ethereal mystery, delicate and flowing. ‘Under Orion’ is classic space music in the style of Jonn Serrie. The last two tracks are excerpts from a live recording from December 2003, and fit very well with the rest. MoonWater is thoroughly relaxing and peaceful from beginning to end. 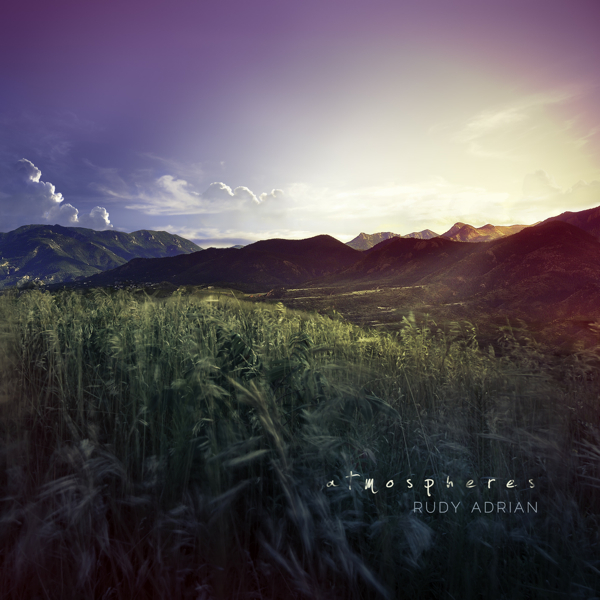 With MoonWater (63'26’), Rudy Adrian celebrates the touching and easy moods of environmental musical fantasy. This work hopes to take the listener out of the real world, with all its uncertainty and isolation, and into Adrian's personal Eden. The nine idyllic compositions are quieting to the mind and envision a harmonious and tame nature. Adrian unitizes a number of interesting methods to portray and convey his convictions including, native flute, field recordings, lilting piano melodies, pleasant synthesizer tones and his own voice, all routed through cavernous reverberation. The grandeur of MoonWater's consonant harmonies is grounded by detailed and imaginative electronic modulations just beneath an aural glow which seems to surround each composition. The result is beautifully flowing and transporting music, contemplative for the mind yet warming to the heart. In this work, synthesist Rudy Adrian explores areas little trodden of Ambient, discovering unreal worlds of contrasting sounds to our ears, which the author knows how to skillfully braid in kaleidoscopic textures. The music is mostly of a cosmic personality. The evolution of the pieces tends to be slow, hypnotic, and it makes our imagination fly to other planes of reality, at times evoking the same sensations of dreams. New Zealander Rudy Adrian, the master of deeply tranquil, heartwarming soundscapes, has released "MoonWater" as his 10th album (including his co-works with Nick Prosser and Ron Boots) and debut release for US label Lotuspike back in 2006. The opening title piece, "MoonWater", unfolds with enormously relaxing natural sounds (cicadas, ocean waves...) and synth washes masterly enhanced by fragilely tinkling bells. Intensely evocative nocturnal journey just begun!!! Follows first part of "MidnightFantasyAngel", leaded by a warmly inviting intimate piano, with highly visualizing drones, which are again nicely enriched by shimmeringly swirling bells. Magnificently nostalgic masterpiece and the first highlight proving the bravura of its sculptor!!! "Summer Fields" with serenely spreading washes are as much soothing as your wanderings through these brightly beautiful and relaxing places. Second part of "MidnightFantasyAngel", the longest composition clocking over 12 and half minutes, moves into deeper, slightly more colossal drone terrains revealing all kinds of fascinating images. Rainy sounds and expressive flute, bell and shaker magics guide "Ancestral Legacy" into mysteriously grandiose primordial realms. "The Legend Of Kristy Lynn" keeps on wonderfully evocative route with deeply droning walls nicely interacting and harmonizing with flickering passages. A composition presenting Rudy Adrian at the very top of his craft!!! The next composition, "Under Orion", is sculpted with celestial washes and crystalline field recordings of ocean waves, another highly immersing tranquilizer!!! "Three Views Of A Japanese Garden, Part 2" is a live version, which has a quite close connection to "MidnightFantasyAngel" composition. Nocturnal drones navigate it into absolutely magnificent domains, which are highlighted by Rudy's wordless vocals, it's like exploring another new instrument skillfully matching the overall context. The use of vocals is quite rare in this genre, but Rudy's vocal performance left me immediately breathless. This is a stunningly thrilling and magical listening experience, bravissimo, Rudy!!! More please!!! Part three of "Three Views Of A Japanese Garden", again a live version, closes this amazingly dreamy journey with all the grace and tranquility. Aural peacefulness of "MoonWater" is precisely portrayed by splendid cover images created by Jeff Kowal/Terra Ambient. 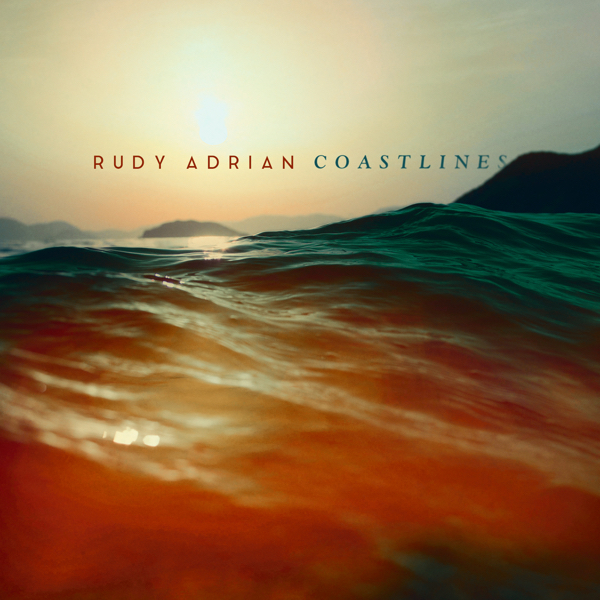 With "MoonWater" Rudy Adrian has definitely entered into my Ambient Hall Of Fame!! !